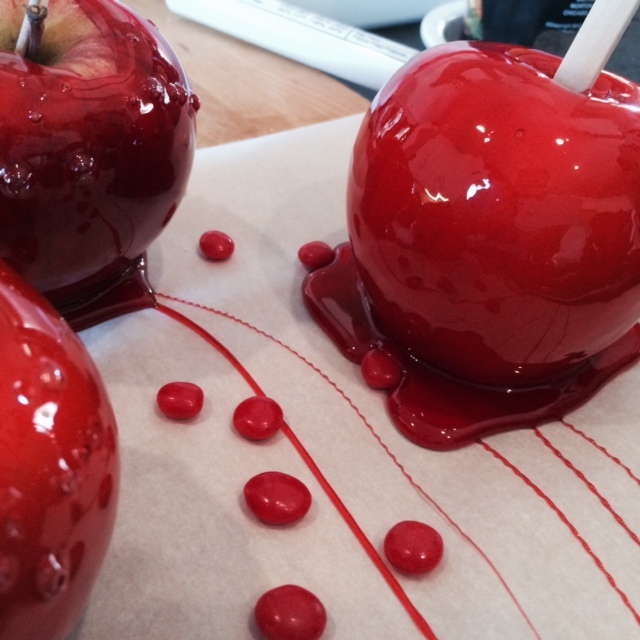 Red Candy Apples are easy to make and bring back childhood memories. When you think of Autumn, you can’t help but think of all the goodies associated with the cool crisp weather. From hearty soups and stews bubbling on the stove, to a fresh apple pie (or pumpkin pie) cooling on your kitchen counter. As a youngster, I always looked forward to those activities…especially the hay rides on wagons pulled by a team of draft horses…. or sometimes they were pulled by a tractor. 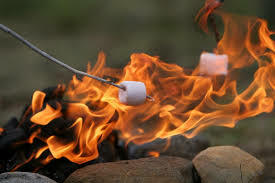 I also loved the big bon-fires and roasting hot dogs and marshmallows on a stick, until the marshmallows were all black and goo-ey. And there were state and county fairs with all the wonderful smells and aromas drifting towards our noses…drawing us in to the food booths ! Near Kansas City, there are apple orchards and pumpkin patches and mazes in the corn fields…that we visited many times. 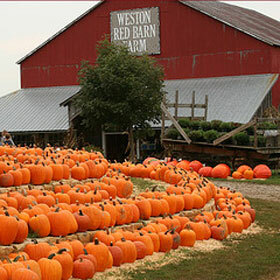 Believe it or not….we have pumpkin patches here in Florida and yes, there are mazes in the corn fields too. Whether it is called Harvest time or Autumn or Fall….it is a good time of the year for me. Come to think of it…I love all the Seasons…and all the foods associated with each one! The recipe below is for Red Candy Apples, which was always a must for me. 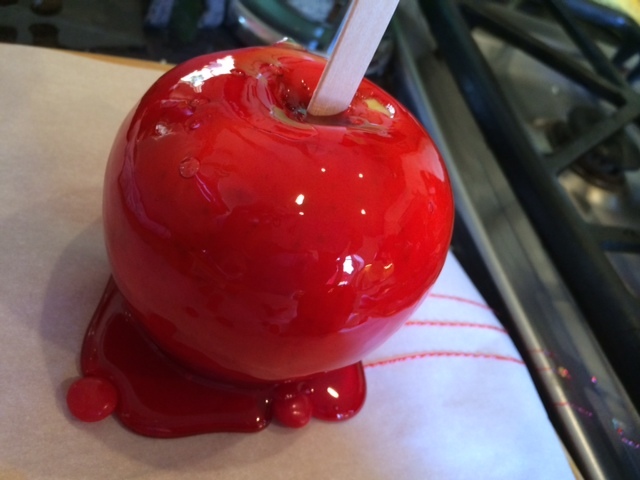 Our family loved corn dogs and caramel apples, but my favorite was the bright, Red, Shiny Candy Apples! 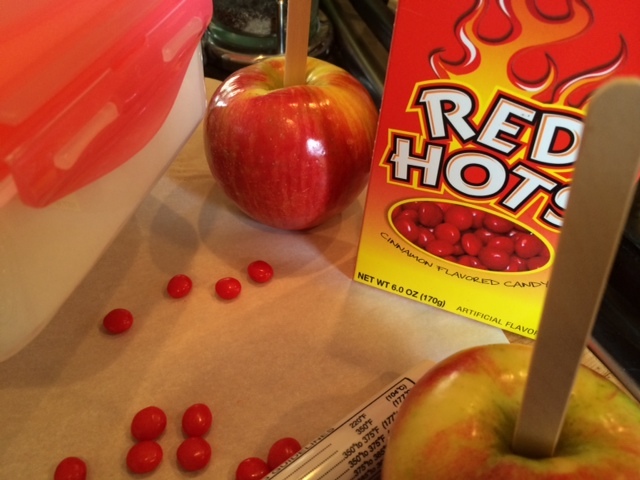 Look at the simple steps to making your own red candy apples! This printable recipe has red hots to give it the flavor and coloring I feel is necessary for a good tasting candy apple, but if you do not want a cinnamon flavor, just add red food coloring to your syrup. Do you have a favorite Harvest/Fall/Autumn food that triggers your memories as a child? Pumpkin Patches, Corn Mazes, County Fairs, Hay Rides, Apple Picking and then eating a Red Candy Apple! How perfect is Autumn? First insert craft sticks into each apple and set aside. Combine sugar, corn syrup, red hots and water and heat over medium high heat. 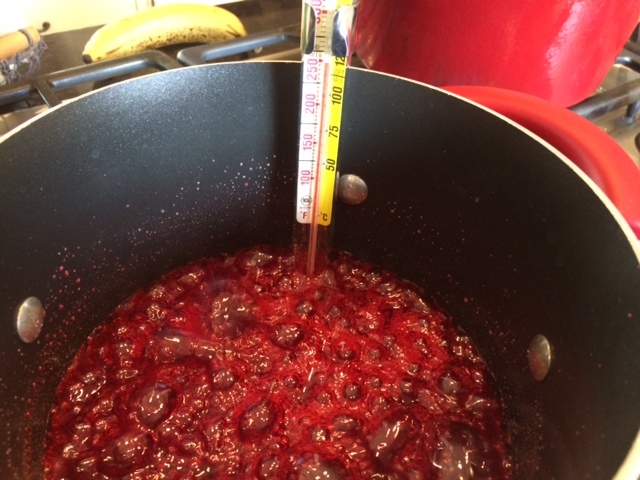 Please use a candy thermometer..they are very inexpensive and make candy making easy. Heat the syrup to 305 degrees (or until a small amount of syrup dropped into cold water forms hard, brittle threads). This will take about 20 minutes of gentle boiling. Remove from heat and begin dipping your apples. 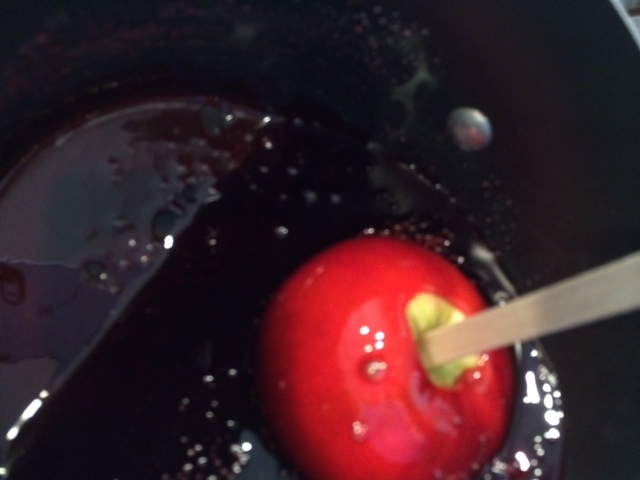 Holding the apple by the stick, tilt the hot pan and dip the apple into the syrup. Carefully swirl the apple to coat evenly. Place the coated apple on parchment paper and allow to harden (do not put them in the fridge). I like to use a medium sized apple ....not too large and when dipping them, tilt the pan to one side to make dipping and coating a lot easier. Always being careful of the hot syrup....it can cause quite a burn to tender skin. DO NOT add any water to the syrup once it is boiling or you will have hot spatters all over you and your kitchen. If you do not like the red hots taste...just use about 15 drops of red food coloring. To easily clean your saucepan, add about two cups of hot water and bring to a boil. The remnants of the sticky syrup will dissolve in the water making for easy clean up with hot soapy water. « Good Witches That Go Splat!!! I love cinnamon, but I still prefer the caramel apples. 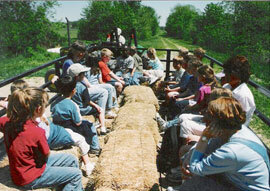 You brought back great memories with the hay rides, bon fires, and cooking hot dogs and marshmallows over the fire. I like burnt hot dogs, too. What fun as we sat around the bon fire singing and eating. You know Sandy…I like burnt hot dogs. When I tell people that, they think I am goofy! So glad to have a goofy friend too! I can close my eyes and smell the bon fire right now. Sure wish I would of thought of the blue apples! Kari, you painted a gorgeous autumn with the inspiring photos. I always loved candy apples as a child. It has been years since I had one. Now, I might just have to make a few after seeing your recipe and how delicious looking yours are. Have a wonderful day! Thanks sweet friend…this time of year always reminds me of county fairs….